Interview Prof Manu Malbrain (CBMI Sao Paulo) from Fluid Academy on Vimeo. 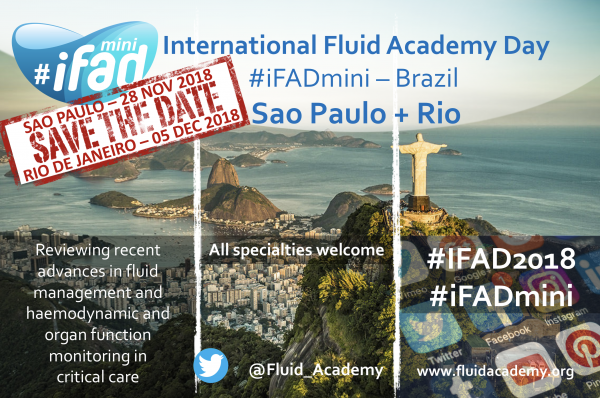 The International Fluid Academy (www.fluidacademy.org) in collaboration with the AMIB organise a full day iFADmini on Nov 28th, 2018. So, if you are going to the 23rd CBMI (Congresso Brasileiro Medicine Intensiva) in Sao Paulo join us for an iFADmini on November 28th, Transamerica Expo Center. If you cannot make it to Sao Paulo then you can join us in Rio de Janeiro on Dec 5th for an iFADmicro evening. Use the official symplur hashtags #iFADmini and #IFAD2018 to boost the numbers! Follow us on Twitter @Fluid_Academy to hear the latest news on Fluid Stewardship.